Transforming government services needs the right people in the right jobs. That’s why we, the Digital, Data and Technology Profession team, are building this capability across UK government. Part of our role is to recruit within GDS itself, where we’re making public services simpler, clearer and faster to use. That means our recruitment approach needs to be innovative too. We wanted something that gives us a bird's-eye view of our recruitment pipeline and there's nothing like a Spider chart to help do this. We’re able to see everything that’s going on in our pipeline and pick out what we want to talk about with our hiring communities. The board helps us plan and manage our day to day workload more effectively, and it also raises the visibility of our work. Making things open makes them better, and we’re happy that people can see what we’re working on and when we’re doing it. We’ve had lots of interest in our Spider chart, so thought we’d tell you a bit more about it. Each live role we’re currently advertising is on a separate card around the outside of the web. The next section shows the number of applicants for the role, followed by number of interviews, with successful candidates in the centre of the web signifying offers accepted and onboarding. There’s additional information added on separate cards showing where the role is being advertised and action notes from vacancy holders - so we collate all the info in one, easy to read format. 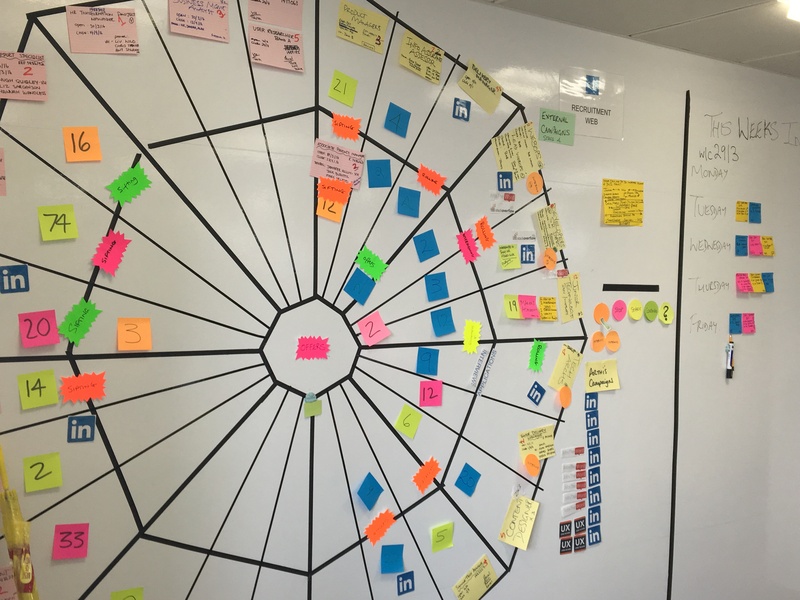 It’s an excellent tool and focal point for our daily stand-ups, and team retros with hiring managers from across GDS. The wall provides us with an at-a-glance dashboard, which displays the data we need. It prompts conversation and dialogue when hiring managers stop to check on their vacancies and we believe it’s a great tool for a collaborative, agile environment. Like the sound of GDS? If you’d like to find out more about the type of roles we are currently recruiting for, or are interested in joining the team please visit the GDS jobs blog where you can find out more. Or if you are interested in finding out more about GDS in general, take a look at the GDS blog.